In this guide we will show you how to fill the Nigeria Customs Service Recruitment 2019/2020 Application Form which will employ 3,200 Nigerians and be selected with ease in other to gain fully employed. Please note this very important information before you start reading this guide. 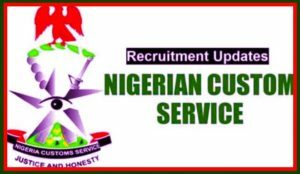 The portal for the Nigeria Customs Service Recruitment 2019/2020 Application Form is www.vacancy.customs.gov.ng and it has been opened for 3,200 Nigerians to be recruited during the recruitment exercise and NCS recruitment is totally free. If you are yet to apply for the Nigeria Customs Service recruitment exercise the portal www.vacancy.customs.gov.ng has been opened for 3,200 Nigerians to be recruited during the exercise. IBOM MEDIA. @ IBOM PLAZA BY AKA ROAD, UYO. Have a fully expanded chest measurement of not less than 0.87 metres, male. According to source and as explained by the Acting Deputy Comptroller-General explained that 800 would be recruited to fill vacancies in the Support Staff for Superintendent Cadre Category, and 2,400 would fill that of Customs Inspector and Customs Assistant Cadre in the General Duty Categories. The Superintendent Cadre are senior ranking officers comprising of Assistant Superintendent of Customs. Assistant Inspectors are Mid-Level officers comprising of Assistant Inspectors of Customs. The Assistant Cadre are junior ranking officers comprising of Customs Assistant. Finally we at Ibom Media are urging you to be careful about the wrong updates about new vacancies by always being updated with information here on our page. If this post was helpful kindly share with your friends using the below social media platforms. Do you know Ibom Air now the Obong Attah International Airport which has just acquired brand new aircraft are recruiting? In this post we will bring to you the list of eligible candidates for 2019 Nigerian Air Force Zonal recruitment exercise and what successful candidates should do on or before the screening exercise, what to carry along for the screening and also the venue for the screening. You can also get the Past Question Here, continue reading. 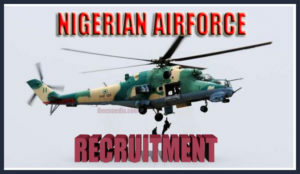 Did you apply for Nigerian Air Force (NAF) recruitment exercise 2019? Here is NAF recruitment 2019 shortlist of selected candidates from all the states of the federation including the Federal Capital Territory (FCT) Abuja. Read on as we bring to you a guide on how to check your name on the NAF recruitment 2019 shortlist. As an applicant of the Nigerian Air Force recruitment, the most important thing that will always be in your mind is how do I download the recruitment shortlist of the selected applicants. We have put together this post to put applicants in the right track. Kindly read through and follow the guide here properly. When is the Screening Date? Having read thus far here is the full list for you to download. 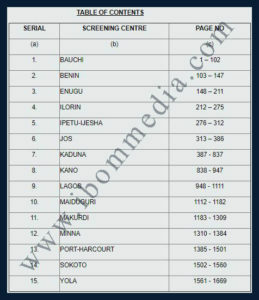 Download and Check your name before proceeding for the screening exercise at various centers shown below. In this post we will be giving you the new date for NIGERIAN AIR FORCE 2019 ZONAL RECRUITMENT EXERCISE and venues. The date formerly suppose to be 2nd March 2019 but has now been shifted to a later date. The reason for the change of screening exercise date is not far fetched as the just concluded Presidential and National Assembly election in Nigeria coincided with the screening date. This leading to a shift in the screening date to a later date. “This is to inform the general public that the Nigerian Air Force 2019 Trades/Non-trades men and women Zonal Recruitment Exercise earlier scheduled for 9 – 23 March 2019 has been rescheduled. The Exercise will now take place from 16 – 30 March 2019. In addition, applicants are once more reminded that the Nigerian Air Force Recruitment process is completely FREE OF CHARGE and without any gratification. Applicants are strongly advised NOT to have any dealings with anyone demanding money as a guarantee for recruitment into the Service, as no applicant is required to make any payment to any individual or bank account at any time during the recruitment process. Moreover, you are advised to keep the new date of the Nigerian air force 2019 zonal recruitment exercise so you don’t miss out of the screening exercise. In this post we will be bringing to you all the guidelines with regards to the Nigerian Airforce recruitment exercise, as the nigerian airforce recruitment exercise for 2019 begins you need to know where to register and the closing date before taking an action. It should be noted that all the application for should be done online. Online registration starts January 12, 2019 and closes on February 23, 2019. After the registration process candidates that qualify after would be invited for Zonal Recruitment Exercise, which would hold from March 9 to March 23, 2019. Those who qualify after the Zonal Recruitment Exercise, would be invited for Final Selection Interview Exercise, after which the list of successful candidates would be published for Basic Military Training. Nationality: Applicants must be a Nigerian citizen by birth. Age: Applicants must be between the ages of 18 and 22 years for non-tradesmen/women, 18 and 25 years for tradesmen/women. Those applying as assistant chaplains/assistant imams and drivers must be between the ages of 18 and 28 years. Marital Status: All applicants must be single. Height: Minimum height is 1.66 meters or 5.4ft for males and 1.63 meters or 5.3ft for females. Medical Fitness: All applicants must be medically fit and should meet the Nigerian Air Force medical and employment standards. Attestation Forms: Applicant’s attestation Form must be signed by a military officer from the same State as the applicant and not below the rank of Squadron Leader in the Nigerian Air Force or equivalent in the Nigerian Army, and Nigerian Navy or a Police Officer of the rank of Assistant Commissioner of Police and above. 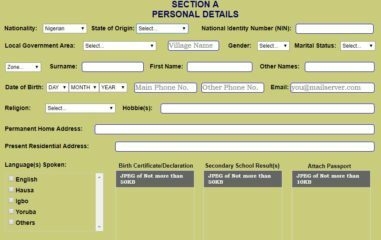 Local Governments Chairmen/Secretaries, Magistrates and Principals of Government Secondary Schools from applicants’ state of origin can also sign the attestation forms. The signee’s passport photograph and either photocopy of drivers licence, international passport, national identity card or permanent voters’ card must be attached. In addition, applicants are to come along with their Local Government Certificates to the Zonal Recruitment Centre and Final Selection Interview Exercise. Presentation of original credentials: Applicants are required to submit their original credentials for scrutiny, at the zonal and final selection exercises. The credentials include the following: Two recent passport size photographs to be stamped and countersigned by officer of appropriate rank specified, Local Government Chairmen/Secretaries and other specified officers in Paragraph 6. (1) Birth Certificate/Declaration of Age (Any age declaration done later than 4 years to this exercise will not be acceptable). (2)Educational/Trade Certificates. (3) Indigeneship certificate from applicant’s State of Origin. Impersonation and False Information/Documents: Any applicant suspected to have impersonated or submitted false document(s) shall be disqualified from the selection exercise. Also, any false declaration detected later may lead to withdrawal from training. Such applicants will be handed over to the Nigeria Police for prosecution. Acknowledgment Slip: On completion of the application forms, applicants must print out the Acknowledgment Slip. a. Bauchi: 251 Nigerian Air Force Base, Bauchi. b. Benin: 107 Air Maritime Group, Nigerian Air Force Benin. c. Enugu: 553 Nigerian Air Force Base, Enugu. d. Ilorin: 303 MAG – Nigerian Air Force, Ilorin. e. Ipetu-Ijesha: 209 Quick Response Group, Ipetu-Ijesha. f. Jos: 551 Nigerian Air Force Station, Jos. g. Kaduna: Nigerian Air Force Base, Kawo – Kaduna. h. Kano: 403 Flying Training School, Kano. Lagos: Sam Ethnan Air Force Base, Ikeja – Lagos. j. Maiduguri: 105 Composite Group Nigerian Air Force Base, Maiduguri. k. Makurdi: Nigerian Air Force Base, Makurdi. l. Minna: 351 Nigerian Air Force Base, Minna. m. Port-Harcourt: 115 Special Operations Group, Nigerian Air Force, Port-Harcourt. n. Sokoto: 119 Forward Operation Base Mabera, Sokoto. o. Yola: 103 Strike Group, Nigerian Air Force, Yola. Non-Tradesmen/Women: Applicants applying for Non-Tradesmen/Women must possess a minimum of 5 credits including Mathematics and English Language in SSCE/NECO/GCE/NABTEB. In addition, applicants are also required to possess their school’s testimonials. a. Applicants must possess at least a lower credit in ND/NCE or any relevant trade certificates from reputable and approved government institutions/organisations. b. Applicants applying as drivers must possess a minimum of 2 passes in SSCE/ GCE/NECO/NABTEB with a credit in English, trade test certificate and valid driving licence. c. Applicants applying as sportsmen/women must possess 2 passes in SSCE/GCE/NECO/NABTEB with a credit in English and evidence of professional experience which will include certificates and medals. Note: that applicants with HND or First Degrees/Post-Graduate Certificates, University Diplomas and Grade II Teachers’ certificates will not be considered for recruitment as airmen/airwomen into the Nigerian Air Force and should not apply. Applicants with medical qualifications should possess evidence of registration with relevant professionals bodies and valid practicing licence(s). a. Medical Records: ND Medical Records. c. Lab Technician: ND Medical Lab Science. d. X-Ray Technicians: ND X-ray Technology. e. Dental Technician: ND Dental Technology/Dental Therapy. f. Pharmacy Technician: ND Pharmacy Technology. h. Biomed Technician: ND Biomed Technology. i. Optometry Technician: ND Optometry Technology. k. Medical Supply: ND Medical Supply. m. Assistant Chaplain: Diploma in Theology/Catechesis. n. Assistant Imam: ND Arabic/Islamic Studies. o. Engineering Technicians: ND Electrical/Electronics Engineering, Chemical Engineering Technology, Aircraft Engineering Technology, Mechanical Engineering Technology/Automobile Engineering and Trade Test in Fitter Machinist. q. Domestic Electricians: ND Electrical Electronics, ND/Trade Test Certificate 1,2,3 Domestic Electrician, Works. r. Building Technology: ND Building Technology/Quantity Surveyor/ Civil Engineering. t. Meteorologist: WMO Class III Meteorology Assistant Certificate, Certificate in ATCA/Base Operator and Fire. u. Public Relations/Info: ND Mass Communication/Journalism/ Broadcasting/Trade Test Certificate in Videography/Photography. v. Secretarial Assistants: ND Office Technology and Management. w. Library Assistants: ND/NCE Library Science. x. Music: ND Music. In addition, playing experience in any recognised Band will be an advantage. y. Driver/Mechanic: SSCE/NECO/GCE/NABTEB and Trade Test certificate, valid driver’s license and practical experience. z. Communication and Information System: ND Computer Hardware Engr/Tech, Software Engr/Tech, Satellite Image Interpreter/GIS Tech, SatCom Hub Installation Tech, Info Tech, Computer Science, Fiber Optic Tech, Network Tech, Cyber Security Tech, Web Designer/Master and Software Developer. Possession of recognized certifications will be an advantage. aa. Sports: SSCE/NECO/GCE/NABTEB are to present evidence of professional experience which may include Certificate of participation/Medals in National and International sporting competitions and in addition ND/NCE Physical Education can be an added advantage. ab. Catering: ND Catering Services/Hotel Management. ac. Education: NCE Physics, Chemistry, Biology, Mathematics, English, Home Economics, Nigerian Languages, French, Business Education, Fine and Applied Art, Basic Science/Integrated Science, Computer Science, Music, Technical Education/Basic Technology, Library and Information Science, Christian Religious Knowledge, Islamic Religious Knowledge. ad. Administration/Logistics: ND Business Administration and Management/Purchasing and Supply/Financial Studies. ae. Legal Clerks: Diploma in Law. af. Psychology/Sociology/Security Studies: ND Psychology, Sociology, Criminology, Intelligence and Security Studies. ag. Languages: ND French/Mandarin/Russian Language. ah. Veterinary Assistance: ND Animal Health. Interested applicants are to note that online registration is free of charge. Applicants are required to fill valid email addresses and Telephone numbers in the appropriate spaces provided in the application form. 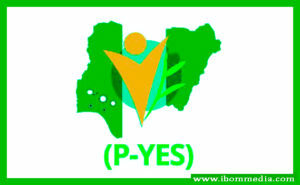 In this post we will bringing to you how and why you should apply for the P-YES program a Presidential Youth Empowerment Scheme which is the best alternative to the federal Npower scheme. P-YES which is the Presidential Youth Empowerment Scheme, powered by the Office of the Secretary to the Government of the Federation, and it is coordinated by the Senior Special Assistant to the President on Youth and Students Affairs, aimed to create at least 774,000 empowerment opportunities via direct youth empowerment over a minimum period of two years. Worry no more if you missed out of the Npower scheme as the P-YES Recruitment Form 2019 is out and covers the “Youth” defined in the Nigerian National youth policy (2009) as male and female individuals whose ages are between 18 and 40 years old. The P-YES scheme will be accessible to the literate, semi-literate and the non-literate population. In fact the threshold for qualification is set at the basic ability and capacity to learn and be teachable. You can contact ibom Media and get a discounted rate for the registration process. Click Here Then Read Down! 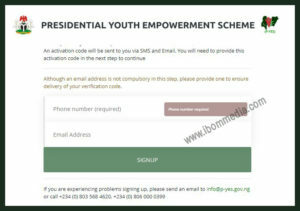 Application For the presidential youth empowerment scheme are to be made via the method above or link below. It is important to note that no registration fees will be required during the application / selection process. Please be aware of fraudulent entities who may try to prey on honest citizens. Thanks for finding this post interesting. This post can be helpful to somebody else, please share it on Twitter, Facebook, G+, Whatsapp or Email with your friends. The Sharing buttons are below simple and easy to use! 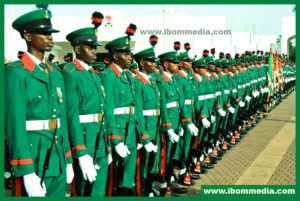 As the Nigerian Army Begins Fresh Recruitment Exercise and the Nigerian Police Form is also on sale, read on to get on how to register for both and your luck will shine this year. The Nigerian Army has announced the commencement of applications for its 78 regular recruitment exercise and called on qualified and interested candidates to apply. According to information made available to on their twitter handle, Ibom Media gathered that the opportunity is available for Nigerians between the ages of 18 – 22. The application opened on Wednesday, 19th December, 2018 and runs through Wednesday, 30th January, 2019. If you an Interested applicants are to create a profile on recruitment.army.mil.ng make sure you are currently on the official recruitment portal www.naportal.com.ng and logged login. Your username must be a functional email Complete the application form, submit online and print a copy. Then, print and complete the Guarantor Form as appropriate. and complete their application. Make sure you provide accurate information while filing the form. It should be noted that all documents will be verified from the appropriate issuing authorities. We at Ibom Media are glad to bring to you that the Police Service Commission (PSC) has announced the commencement of the process of recruitment of 10,000 Nigerians into the Nigeria Police Force as Constables. PSC in a statement in Abuja on Friday signed by its spokesman, Ikechukwu Ani, said the application, which will run till the 11th of January, 2019 should be done online. Address: No. 1 Aka Road by Plaza. The Commission also noted that the exercise is absolutely free, adding that interested candidates should not to pay any money to apply and should not return any completed forms to anybody who might in the process demand for processing fees. The statement reads: “Applications from interested candidates will be received online and through the Commission’s portal, www.nigeriapolicecareers.net. Continue reading as we bring to you the requirement for the position, the Commission said: “Applicants must have passion for a career in the Nigeria Police Force and must be a Nigerian citizen, not less than 18 years of age or more than 25 years of age. “Candidates must have an 0 level certificate or its equivalent with at least five credit level passes including Mathematics and English language in not more than two sittings. The Commission said it will deal ruthlessly with anybody no matter how highly placed, who tries to circumvent the process or engages in fraudulent activities. “Specifically, it warned that Staff of the Commission or Police Officers caught demanding or collecting money to assist candidates in this exercise will not go unpunished,” it added. Akwa Ibom International Airport Application/ Guideline on How to Apply. Akwa Ibom International Airport is set to embark on changing the flying experience in Nigeria and is looking to recruit young, energetic gentlemen and ladies interested in careers in the aviation industry. Airport Online Job Application |This is to inform the general public and suitably qualified Nigerians for Ibom Air online Job Application, The Guideline, Requirement and Procedure on how to apply,Focus attention and read through. Job Application portal for Akwa Ibom State Air port is Currently open for interested young, energetic gentlemen and ladies in Nigerian. Note: Applicants are to note that the entire application process is free and they should refrain from giving money to any individual under any guise. Applicants are advice to summit application online with the valid email address and Phone Number for the successful applicant will be contacted for physical and credential screening. To access the Ibom Air online job portal, you must first signup to the portal with a valid Gmail Account and after successful creation of your portal user account. Carefully fill your Bio Data form and summit online. Double application lead to disqualification and it will be screened out automatically. Is this article informative to you? if yes, don’t delay to share this information across to your friends on Facebook, Twitter, Whatsapp and Google plus on media. The Nigerian Navy wishes to inform the general public that the aptitude test for the Direct Short Service Course 26 enlistment exercise is scheduled to hold in 8 centres across the nation on 1st December, 2018, at 7:30am. Below are shortlisted candidates for DSSC 26 aptitude test scheduled to hold in 8 centres across the nation on 1 December 2018 at 0730 (7:30 am). Candidates are to check and proceed to the centres indicated, all centres of choice were upheld except where doubts exist in the filling of the forms. Candidates who applied for Abuja and Lagos should note that there are 2 centres each, hence they should endeavour to confirm which of the centres their names appear and proceed there. Only those on a centre’s list would be allowed into the centre for the test. NYSC Discharge/Exemption Certificate (Compulsory. Serving Personnel to present letter from unit /ID card). Mobile Phones and any other forms of communication devices are prohibited from the examination halls. Applicants are advised to visit http://joinnigeriannavy.com for the candidates shortlisted to write the test and further instructions. Bauchi – Command Day Secondary School, Shadawanka Barracks, Bauchi. FCT 1 – Army Day Secondary School, Mogadishu Barracks, Abuja. FCT 2 – Command Day Secondary School, Lungi Barracks, Abuja. Abia State – Nigerian Navy Finance and Logistics College, Owerrinta. Lagos 1 – Nigerian Navy Secondary School, Navy Town, Ojo. Lagos 2 – Navy Town Secondary School, Navy Town, Ojo. Rivers State – Nigerian Navy Secondary School, Borokiri, Port Harcourt. Sokoto State – Army Day Secondary School, Giginya Barracks, Sokoto.